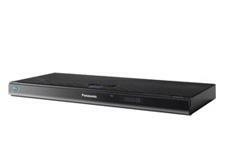 Panasonic's 2011 Blu-ray line includes three 3D-capable models. With an MSRP of $199.99, the DMP-BDT210 falls in the middle of the 3D pack, a step up in features from the DMP-BDT110 but lacking the dual HDMI outputs found on the DMP-BDT310. We have not performed a hands-on review of the DMP-BDT210, but here is an overview of its features. New to this year's 3D Blu-ray lineup are 2D-to-3D conversion, a 3D Effect Controller, and Skype capability (with the addition of an optional USB camera/microphone). This model also adds the new Touch Free Sensor that allows you to open/close the disc tray by waving your hand over a top-panel motion sensor. The DMP-BDT210 has integrated WiFi, and you can stream content from a PC or DLNA-compliant server. The player supports Panasonic's VIERA Cast Web platform, which adds CinemaNow and Napster to its repertoire this year. VIERA Cast continues to offer Netflix, VUDU, Amazon VOD, YouTube, Pandora, and more. • Read more Blu-ray player reviews by HomeTheaterReview.com's staff. • Find software in our Blu-ray Software News section. In terms of video connections, the DMP-BDT210 offers a single HDMI output, as well as a composite video output. Beginning this year, manufacturers are no longer allowed to include HD-capable component video outputs, due to copy-protection restrictions. General picture adjustments include the ability to choose between preset picture modes or go with a user mode in which you can adjust contrast, brightness, sharpness, color, gamma, and noise reduction. The video menu also includes adjustments for chroma process, detail clarity, and super resolution. In the 3D realm, Panasonic is the only Blu-ray manufacturer I'm aware of that allows you to change the 3D signal type to output the side-by-side format or the checkerboard format, which is compatible with older 3D-capable TVs from Mitsubishi and Samsung. As I mentioned above, you can also enable 2D-to-3D conversion, and the new 3D Effect Controller allows you to select a normal or soft picture and manually adjust the distance (depth), screen type (flat or round), frame width, and frame color for 3D video. On the audio side, outputs include HDMI, optical digital (no coaxial), and stereo analog. The DMP-BDT210 has onboard Dolby TrueHD and DTS-HD Master Audio decoding, and it also passes these high-resolution audio formats in their native bitstream form over HDMI, for your A/V receiver to decode. Audio adjustments include 7.1ch audio reformatting, audio sync, dialog enhancement, High Clarity Sound to improve clarity from TV speakers, and the ability to select different sound-effect modes (Digital Tube Sound; Re-master 1, 2 and 3; and Night Surround). The DMP-BDT210 supports BD, DVD, CD audio, AVCHD, MKV, MP3, MPO (3D still pictures), and JPEG playback. You can add the player to your home network via the back-panel Ethernet port or integrated WiFi. The player has two USB ports: one on back to add a USB camera for Skype and one on front for media playback. The DMP-BDT210 lacks internal memory to store BD-Live content, but an SD card slot is provided for this purpose (it also supports media playback). The player lacks advanced control ports, such as RS-232 or IR. Read about the high points and low points of the DMP-BDT210 Blu-ray player on Page 2.